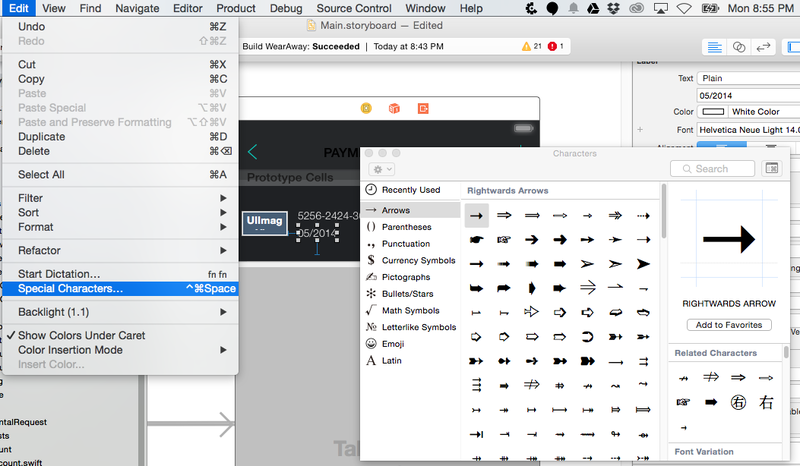 Before designing icons for your iOS app UI, take a look at special characters panel. Until an hour ago, when ever I needed an icon for my iOS app’s user interface, I would open photoshop and design the icon. Then, I had to duplicate the icon in different sizes, then import the iconset in the project. I just learned a very simple tip that saved alot of work for me. Before, designing icons for your UI, do the following to see if you will find the icon that you are looking for. The advantage of special characters is that, the size is fully flexible and also, there are no files to import. My most favorite advantage is that, the color can be set to anything you want.